For a while, it looked like all of the molten salt startups where outside Europe, while Europe’s molten salt contribution was limited to publicly funded research programs. Even though the German/Canadian DFR has been – and still is – putting effort in finding funding for actually getting a real startup firing up, London based Moltex has already moved past this initial phase. Moltex is a real startup, presenting their own brand of molten salt reactor design as their entry ticket to the molten salt reactor movement. In Moltex, Cambridge nuclear physicist Ian Scott and philantropic environmentalist John Durham, co-founder of The Alvin Weinberg Foundation, have found a common goal in building their Stable Salt Reactor as soon as the authorities will let them. Essentially, the reactor core of the Stable Salt Reactor is closed cooking pan, only half of it filled with molten salt coolant. 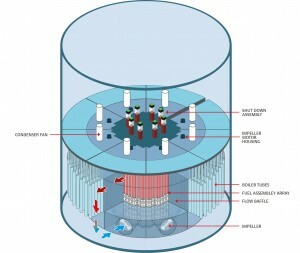 The liquid fuel is not mixed with the larger amount of molten salt, but contained in an array of tubes in the middle (red). The blue tubes in the outer region are the boiler tubes that take the heat out of the reactor core. These tubes and the core, separated by a ring of ‘bafflers’ that create a flow path, cooperate in creating a convection flow that does not need additional pumping. On inspecting the proposed design, one cannot help but note similarities between the SSR and the EVOL’s MSFR design by Else Merle-Lucotte and her team. Both feature a salt flow that roughly has the shape of a doughnut. But instead of proposing a free flow of salt at the place where the hole should be – the hallmark of EVOL’s MSFR – the SSR fills the hole of the doughnut with an array of tubes that contain the liquid fuel. Here’s the link to Moltex’ page with an animation of their basic core design. It’s interesting that three European designs proposed (DFR, MSFR, SSR) are all fast reactors, meaning they use fast neutrons to get and keep the chain reaction going. Although it is even more difficult to predict how the regulatory authorities will respond to plans for fast reactors, this type of reactors have some clear advantages over thermal spectrum reactors (that use ‘thermal’ neutrons, meaning slower neutrons that have different reaction properties). One important advantage of fast reactors is their ability to use more simple salts: Moltex uses chloride salts – neither lithium or beryllium will be required. Another aspect is that fast reactors are very good in burning up all the ‘nasty stuff’ like plutonium. A more full discussion of Moltex and its SSR will appear later on at daretothink. In 2014-2015, UK based consultancy firm Energy Proces Development conducted a worldwide survey of molten salt startups and designs. 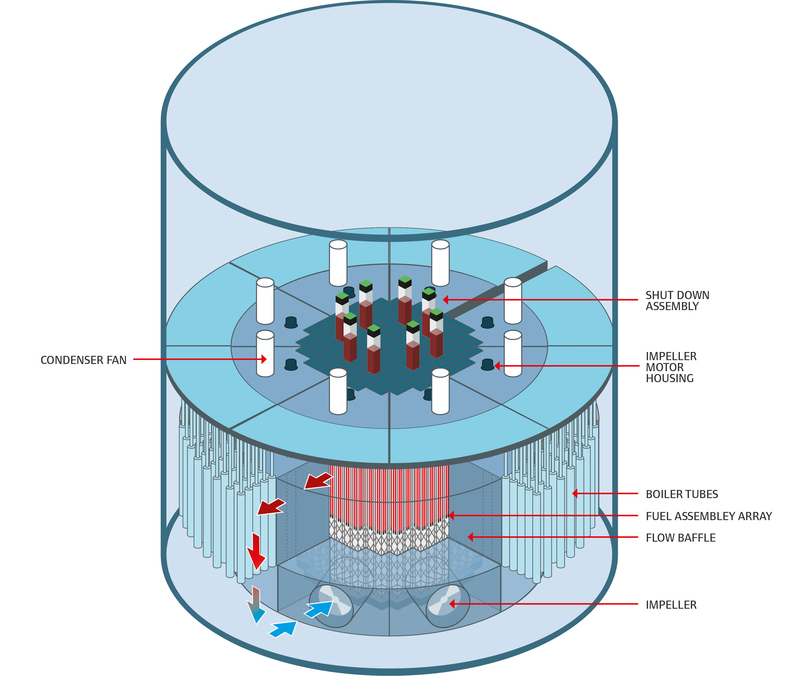 Moltex SSR was appointed as the most suitable for development of a pilot scale reactor.